The classic thigh trainer and body toner is back! Thigh Master provides the resistance needed to effectively tone and slim thighs, hips, buttocks, stomach, pectorals and triceps. 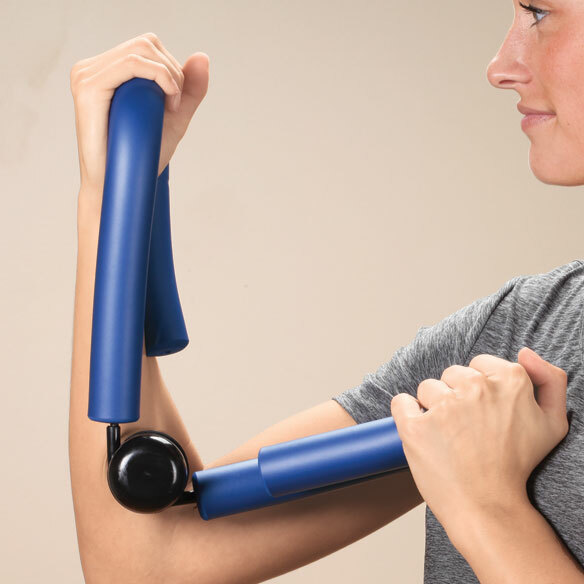 Versatile device exercises your entire body to promote healthy bones, muscles, joints and circulation. A great way to get the resistance training needed as we age. Spring-loaded steel core is covered with soft, durable foam. Lightweight and portable for home or travel. Perfect for men or women of all ages and fitness levels. Thigh exerciser measures 19 1/2"L x 7"W.
It's a quality unit, and it will last a long time. Will it help with incontinence.? helps with loosing extra weight off of thighs. It looks like it will work well! I have one I bought sometime ago. I'm giving it to my sister, so I needed another one for myself. Good sit down exercise tool. Need to tone my inner thighs; thigh master is a well known brand, but I looked through the options from my initial search. This thigh toner seemed sturdier than the one from wal mart. I had one a long time ago and I want to get mu upper thighs stronger. Always wanted one and could not find until now. Thanks. have incontinence, weak stomach, weak hip muscle. I need to firm my thighs!Exercise. Time! To work on legs and muscles. Chiropractor suggested this would strengthen legs, gluts, and provide more back support. I use to have one but I lost it. So when I saw that you were selling them I had to get one. Previously owned one and I wore it out spring snapped.So this is a replacement. Who doesn't remember the tv ads?!?!? How do you use it? Does it come with instructions? BEST ANSWER: It didn't come with instructions, but it's pretty obvious how to use it once you look at it. It can be used with either legs or arms. It's just a resistance workout, so you can use as much resistance/force as you like & build to higher levels as you get stronger. You can probably find a visual explanation & demonstration on youtube.